Over the holidays I was searching for some Christmassy recipes for a dinner party we were hosting. I love trying new recipes and am really into cranberries right now. Cranberries are a super food that often gets overlooked because of the tart flavour. Obviously, as a stand alone snack, they aren’t great, but I often add frozen cranberries to my morning smoothies and love them. WebMD suggests that cranberries are second only to blueberries in their total antioxidant capacity. Cranberries have vitamin C and fiber, and are only 45 calories per cup. In disease-fightingantioxidants, cranberries outrank nearly every fruit and vegetable–including strawberries, spinach, broccoli, red grapes, apples, raspberries, and cherries. One cup of whole cranberries has 8,983 total antioxidant capacity. Only blueberries can top that: Wild varieties have 13,427; cultivated blueberries have 9,019. Dr. Nalini Chilkov also outlines seven reasons why we should include cranberries in our diet on Cancer Schmancer. Check it out to see how cranberries can benefit your over all health and wellness. I came across this recipe for Roasted Balsamic Cranberry and Brie Crostini on NeighborFood and it sounded delicious. Sometimes when you read a recipe you just know that it is going to be fabulous. Such was the case with this one. I knew it would be a winner and it certainly did not disappoint ~ thanks Courtney! You really must visit her blog and check-out the fabulous pictures. When I made these I was in the midst of preparing for company and in all honesty pictures were a mere after thought (and as you can see my daughter had changed my camera settings and I didn’t even get one good picture). 2. Combine the butter and olive oil in a small bowl and whisk. Brush both sides of the baguette slices with the oil mixture and place on a baking sheet. Set aside. 3. In a second small bowl, add the cranberries, balsamic vinegar, sugar, and rosemary. Mix. Spread the mixture out on a rimmed baking sheet that is lined with parchment paper. 4. Place the cranberries in the oven and roast for five minutes. Add the tray of baguette slices to the oven. Roast for an additional 6 minutes. Remove the baguette slices to flip them over and return to the oven for another 4­-6 minutes, or until crispy and golden. At this point, the cranberries should be popped open with juices running out. Remove both the cranberries and baguette slices from the oven. 5. Top each baguette with a slice of brie and a spoonful of cranberries. Garnish with thyme, if desired. These can be served while the cranberries are still warm, or you can make the components ahead of time. The cranberries can be chilled overnight and the crostini will keep in a zip lock bag. Simply assemble and serve at room temperature when you’re ready! When I made this appetizer for our dinner party, I ended up with a small amount of the cranberry mixture left over. I simply refrigerated it in a covered container and served the cold mixture over a bed of greens with purple onion and feta. No dressing necessary. This made a salad that was both beautiful and delicious! In fact, it was so good that I’ve since made another batch just for salad topping. Mmmm….so good! The combination of flavours in this recipe is so great, that I really hate to mess with it. However, I do try to reduce the sugar in recipes when possible. Next time I make it I will try to reduce the sugar amount slightly – I might try 1/3 of a cup and see how that works. Enjoy! Peel the cucumber and slice it in half lengthwise. Use a spoon to scoop out the seeds. Dice. Place the diced cucumber in a mesh strainer and sprinkle with salt. Toss to evenly coat the cucumber chunks. Allow to rest 30 minutes at room temperature. Rinse the cucumbers and place over several layers of paper towels. Squeeze some of the liquid from cucumbers (almost as if wringing moisture from a cloth). Place the cucumbers in a food processor and pulse to chop to desired size. Add in Greek yogurt, garlic, lemon juice, olive oil, red wine vinegar, parlsey and dill. Season with salt and pepper to taste. Press pulse to blend or if you want it chunky you can simply stir the other ingredients. Store in the refrigerator in an airtight container up to 3 days. A friend made this dip a while back and Eden (my avocado hater) had to be physically removed from the dip for fear she would eat the entire bowl herself. This is super yummy and a somewhat unique combination of flavours. This recipe was found on My Recipes. It is a great summer appetizer as it is bursting with colour and the awesome flavours of fresh tomatoes and avocado. Mmmm. I hope you like it as much as we do! Place the first 9 ingredients in a bowl and stir . Add the chopped avocado just before serving. Gently stir the mixture. Serve with assorted tortilla chips. Another of my favourite Mexican appetizers is this delicious hot layered dip. It is one of those dips that tends to keep you hovering around the food table…just can’t get enough! Mix the taco seasoning with the refried beans and spread evenly in a shallow flat bottomed oven proof dish. (I use a quiche plate.) Spread a layer of sour cream over the bean mixture. Top with a layer of salsa. Sprinkle shredded cheddar on top and add olives, if desired. Bake at 350 degrees for 30 minutes. Serve piping hot with nachos. It is with great sadness that we are off to celebrate the life of my Auntie Lynn today. After the service, we are heading out to family farm where my Auntie Lynn and Uncle Murray raised their family. I am not sure who all will be there, but we have a large family with members stretched from coast to coast. It is only a year since my Grandma passed away and the family joined to celebrate her life. We meet again much too soon or at least too soon to be gathering for another lost icon in our family. Despite the terrible loss, it will be nice to catch-up with everyone and I thought I would take a few Mexican appetizers to help feed the masses when the service is over and family gather at the farm. There are many versions of this recipe. I got this one from a friend several years ago and am not sure of the original source. It is an easy and yummy appetizer that would also make a great snack or lunch for kids. Mix the ingredients in a bowl. Scoop some of the mixture on each tortilla and spread it to cover the surface. Roll the tortilla like a cinnamon roll. Store in layers, covering each layer with a damp paper towel. Store in an air tight container in the fridge. When you are ready to serve them, cut each roll into 1″ slices and serve with extra salsa. Hard Boiled Eggs in the Oven? If you frequent Pinterest, I’m sure you have seen the pins showing how to bake eggs in their shell instead of hard boiling them on the stove. If you read my Devilled Egg post back in the summer, you would understand why I jumped all over this idea. So, I decided to try this out for our Easter eggs. I basically did exactly what was suggested on the “pins”. I preheated my oven to 325 degrees. I placed my eggs in a muffin tin and baked them for 30 minutes. After 30 minutes I removed them from the oven and transferred them to an ice bath. Like some of the other pinners, my eggs ended up with brown spots on the shells and even some spots that looked a bit scorched. Decorating wasn’t high on my kids interest list, so we ended up peeling and eating some of the dozen that I baked. All of the eggs had little brown/scorch marks on them in a place or two. It had no impact on the taste, but if presentation was of concern, I would not recommend this technique. I’m not sure what causes this, but I have to admit I did not turn the eggs during the 30 minute bake time. Some suggested turning them half way through the baking time and others didn’t, so of course I opted for the easier of the two and didn’t bother turning them. I’m not sure if turning would have prevented this or not. Although my muffin tin was clean, it is well used and “seasoned”. I’m not sure if this was the problem or not. 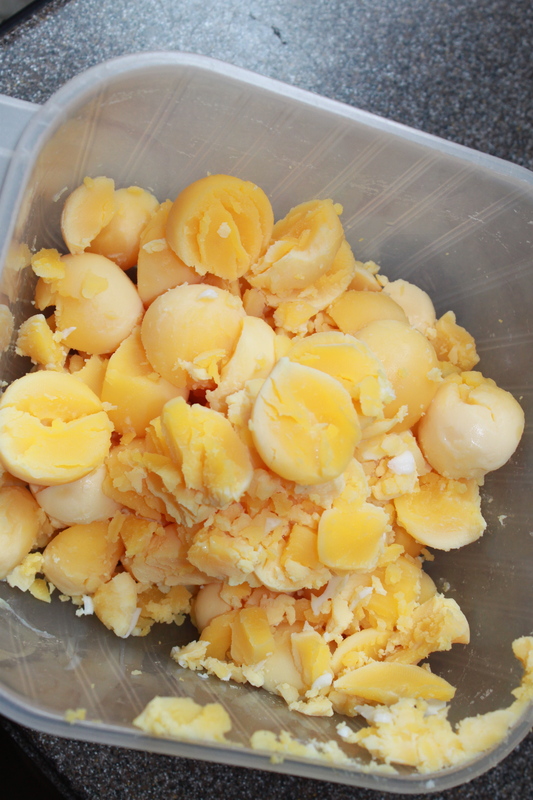 This works well if you are making egg salad sandwiches for your family, but I wouldn’t recommend this method for devilled eggs you plan on serving to company or for decorating Easter eggs. Having said that, it didn’t really impact the few eggs we decorated this year. We just made sure to “colour” over the spots and you really couldn’t see the brown marks, but it would totally depend on how you were decorating your eggs. Based on my one experience with this cooking method, I think I’ll probably stick to the traditional method and just boil them. Cool idea though! Place the eggs in an ice bath. You can see the discolouration on the eggs. Most of the marks washed off this one, but 1/12 isn’t a great result. FYI They didn’t peel any easier either! I am a very reflective person. I take pride in knowing myself well and am fortunate to have worked hard and developed some good skill areas. I am very committed to becoming good at anything I am interested in and passionate about. However, the opposite of this is also true. There are many things that interests me little and therefore I know little about and spend little time getting better at them. The list of my limitations is long, but three jump to the forefront of my mind at this moment. Politics – I have zero interest and know nothing. Gardening. Give me a plant and I will generally kill it. My husband continually reminds me that plants need water, but somehow I still don’t seem to get that concept. I do the planting in the spring and think I do an okay job at that, but my husband tends to the garden and waters regularly. I am not even very good at harvesting. We thought we’d try a few more veggies this year. Some have grown well, some have not. Few have been harvested at the right time. I guess it doesn’t really pay to grow your own if you don’t actually pick the lettuce when it is ready, and before the ends begin to turn curl and turn brown. Music – I have no ear for music, can’t read a single note and get stressed out when I am asked to clap to the beat. I do like to sing and dance in the privacy of my home where I let my family’s eye rolls and criticism slide off my back. Fortunately for me, I teach 5 year olds and regardless of how bad you are ~ kindergartens generally love their teacher and think they walk on water, so we do lots of singing and dancing at school…. but you won’t catch me joining the choir! Deviled Eggs ~ I actually didn’t know this was so close to the top of my list until yesterday. Let me explain…. I love deviled eggs and my mom would often make them when I was growing up. 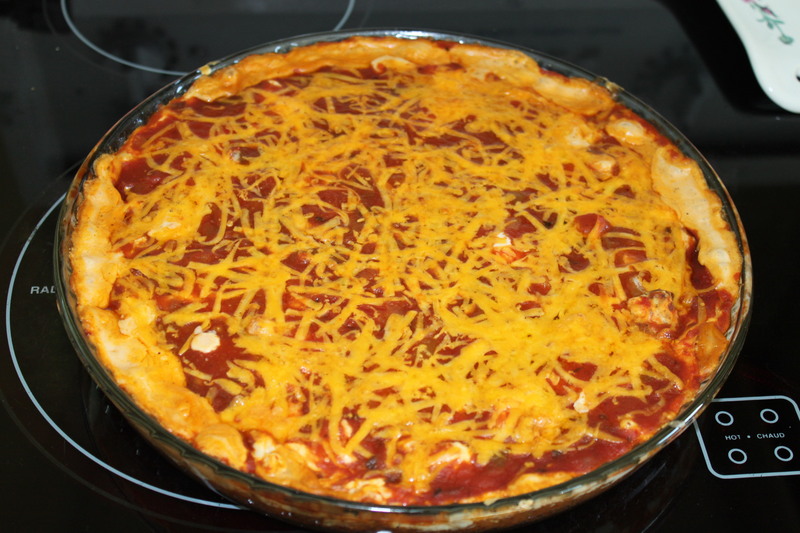 Again, eggs were not expensive and she had all of the ingredients on hand, so they made a perfect pot-luck dish or extra side-dish when company was coming. I have made deviled eggs several times in the past and I think they tasted good. Not so good, that you won’t forget them, but good. However, I have only ever made them for my immediate family and have never really worried too much about the divots in the outsides or the presentation, it was much more about taste. Generally, I prefer to put my eggs in a pot, boil the “dickens” out of them (I think I am turning into my mom) and then mash them up for egg salad sandwiches. 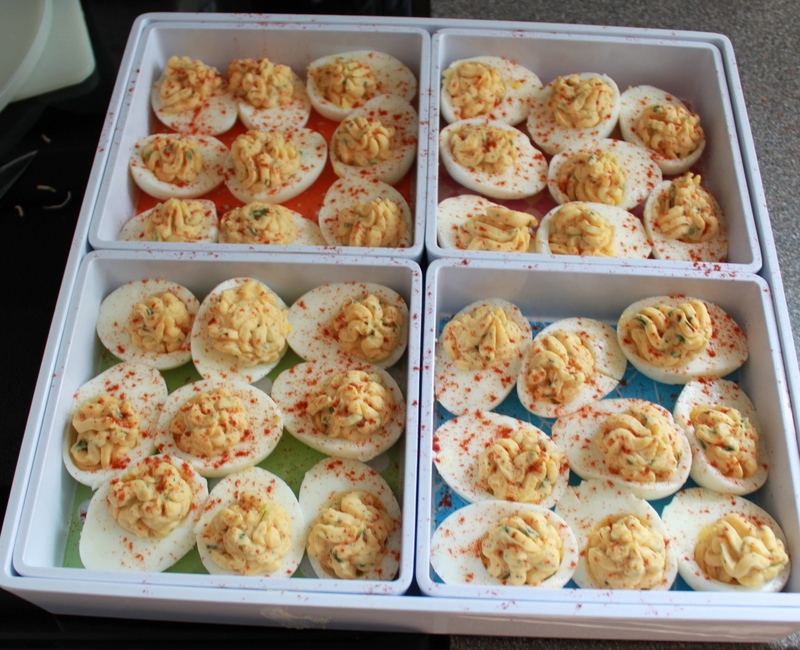 However, I decided that this year, I would make deviled eggs for our annual block party potluck dinner dish. I knew that peeling the eggs would be a challenge for me, so I did what any perfectionist would do, I Googled it. Evidently, I am not the only person who struggles with this task, as there were many posts about it. There were lots of tips, many of which I tried to follow. Here are some of the things I learned about boiling eggs (I seriously thought you just put them in a pot – who knew there was a specific way to do it). When I originally wrote this post, there were two sites I used as a reference: MOMables and Food.com. Since then, a more up to date and comprehensive blog post was written on My King Cook. This is a very informative article with many great references, video clips and suggestions. Everything you might want to know about eggs can be found here. I also love that they included some great egg recipes. I have recently been trying to drop a few pounds and must say….eggs are one of my best friends! Gotta love them! The salt won’t affect the flavor of your eggs; it helps solidify the proteins within the egg, helping create an easier to peel egg! I have used both iodized (table) salt and Himalayan rock salt (the pink salt in my photo) and both have worked perfectly. Only cook the eggs for two minutes and then remove from heat and let stand, covered, for 10 minutes. Give the cooked eggs an ice bath right after cooking. 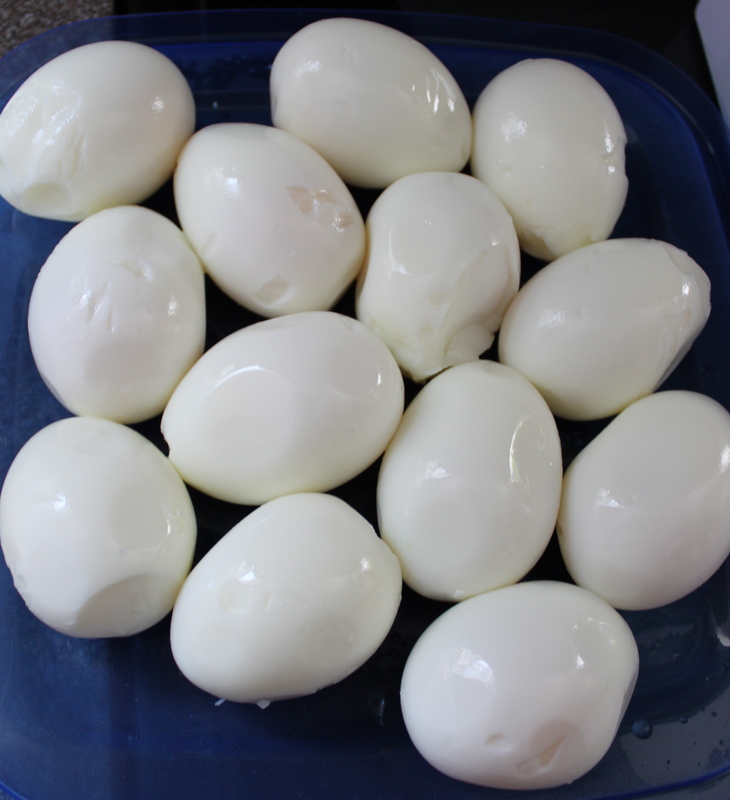 I did my research and learned all the tips to make perfectly cooked hard-boiled eggs. I knew what the experts had to say and began to take action. We go through eggs like there is no tomorrow, often as many as 36 per week, so needless to say I would never have eggs sit in my fridge for 2 weeks or more. I immediately began phoning neighbors to see if they had older eggs. We began to exchange “expiration date” information and I managed to get 30 eggs that were much older than mine. I am not sure how old, but he expiration date was August 24th and mine expired September 18th, so I thought it was a good trade. I gently set the eggs in the bottoms of two big pots because I wasn’t sure if layering was a no, no. I covered the eggs with lukewarm water, added 1 T. of salt (I knew I would need all the help I could get) and the 2 tsp. of vinegar and set the pots on the stove to boil. I watched the pots like a hawk and when they reached a full boil (or at least what I determined to be a full boil), I turned my timer on for 2 minutes. Evidently, the greenish-gray ring around the yolk results from over cooking. Mine always looked like that, so I thought that was normal!! Go figure? I removed the pots from the heat and covered them with a lid. I turned the timer on for another 10 minutes. (At this point, I was already feeling a little stressed about how my eggs were going to turn out, but I knew I was doing everything the experts told me). After 10 minutes, I removed the eggs and rinsed them in very cold water and then transferred them to an ice bath which was made up of very cold water and several cups of ice cubes. You were to let them sit in the bath for 5 minutes. I must say, this was one of the hardest tasks I have had to endure. No kidding. It was like I was trying to win some kind of internal battle between two drastically different personality traits. Although I have never been diagnosed, I believe that I have Attention Deficit Disorder and that I come by it honestly. If you have ever met my father, you would know what I am talking about. He has two speeds “go” and “sleep”. He is 77 and literally only stops to sleep (any time, any place). He can’t even stand still without jiggling the change in his pocket. For the most part, I have complete control over this and have strategies that help me cope. I do things like make lists to keep me organized and take notes when listening to a speaker (to keep me engaged). However, the battle that ensued between my ADD and my perfectionist trait was one for the record books. Let’s just say peeling the perfect eggs takes PATIENCE beyond anything I could ever imagine. I am tensing up just thinking about what I endured peeling those 30 eggs last night. I am all about problem solving and strategy, so I wanted to try out one of the tips I learned on the first egg. The poster said to crack the egg and gently roll it on the counter to create breakage all around the egg. This would help you to get the holy grail of boiled eggs ~ the membrane. I tried it out on the first egg and immediately broke it right in half. Ugh! I guess she meant really gently. This was not the start I was hoping for. As I went through the eggs one by one, I tried different strategies ~ like did it work better when I started breaking off the shell on the side, top or bottom of the egg. Should I use the end of my thumb or the side? Do I try for the big piece or the little tiny time-consuming crumbles of shell? I set out determined to peel each and every egg to sheer perfection, but this was to no avail. 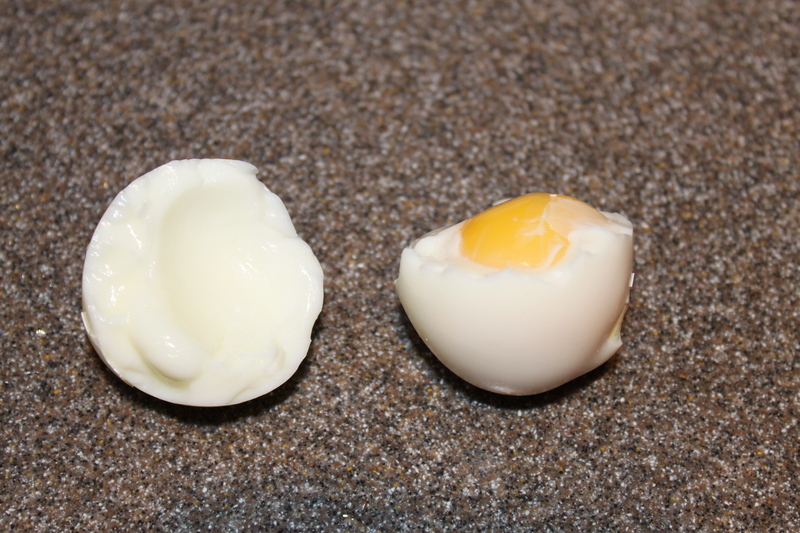 For some eggs, I made a flaw in the white flesh with the first pull of the shell. Can you imagine the torment of having to continue to peel an egg slowly and carefully when I knew it is already damaged goods and less than perfect. By the second divot in an egg, my legs were squirming and I was tense all over. I was generally able to work slowly and carefully until the moment when the perfect exterior became flawed and I had to settle for less than perfect and yet continue to finish the task with a steady hand and patience. This was so beyond my scope of management. When creating a card or a project, I just scrap it and start over, but the reality was that there were no more old eggs to boil. I had to salvage and use what I had. No repair job, no re-do, no make-over. It was killing me. I was catching my self shifting my weight from one foot to the other, clearly agitated and using self-talk to make it through. “I can do this.” “How hard can this be?” “The next one will be better.” “Take your time.” “Careful now, just slow down.” I felt like some kind of a nut case on the brink of losing it. Never before have these two elements of my personality battled it out in such a way. Not one perfectly peeled egg. Despite my research, precision in following the directions and formidable attempt at peeling slowly and carefully not one egg survived unscathed. There were many that made it up until the final shell was being removed. The roller coaster of hope and failure was one I won’t be riding again for a long time. (And yet, deep down there is still a battle waiting to be won – someday, I will be able to peel an egg without error, but not today). I can’t say the tips didn’t work, I truly believe this is my own challenge, so don’t disregard the tips, they just didn’t help me. Whenever my mom made devilled eggs, she just tossed in some mayo and green onion, salt and pepper and sprinkled them with paprika. No recipe, she just went by eye and taste. I have always done the same, but because I am taking these eggs to the potluck. I decided to actually follow a recipe. I decided to go with a recipe that had a 5 star rating from 126 reviews. Pretty good odds, I think. It is called Kittencal’s Best Deviled Eggs from food.com. The recipe calls for mayo, milk, parsley, chives, mustard powder, dill, salt, pepper, garlic powder and paprika. Sounds good and great reviews. This part of the dish is easy. Mix the egg mixture and pipe them into the whites. I am hoping to make them look good enough that people won’t even notice how I butchered the eggs when peeling. (By the way, the yolks did cook perfectly with no greenish-gray ring around the outside). I don’t actually remember my mom ever fighting with boiled eggs. I don’t know if she had this little system licked and never had a problem, or if she was less of a perfectionist and really didn’t care if the eggs were perfect. Either way they always tasted great, and I guess the look really didn’t matter, as I for one don’t remember if the whites were perfect or not. I must say that this was a pretty humbling experience. In general, I produce a pretty good product. I am not saying that I have never had a desert that didn’t set properly or a roast that over cooked because I have, but in general, when I make or do something I do it pretty well. This result is so sub standard for me and the incredible stress it brought really caught me off guard. I have decorated cakes that have required supreme patience and a very steady hand. No problem! I would never have thought that peeling eggs would be so hard for me. What an eye-opener! The next time I eat someone else’s devilled eggs, I will have a new respect and appreciation for the chef that prepared them. It’s painful! I will take cake decorating over egg peeling any day! I think the egg filling tastes okay, but the recipe says to let the flavours blend for several hours, so we’ll have to wait and see. From the top, they don’t look so bad ~ the deep dish helps hide the utter mess below. Over all this was somewhere between an epic fail and a slim pass. Hopefully they taste great!